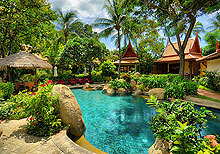 A tiny magical oasis of tropical enchantment, Poppies Samui lies on a pristine white sandy beach in the Gulf of Siam. Located at the south end of renowned Chaweng beach, well away from the hustle and bustle of the main resort area, Poppies has earned its reputation, since opening in 1994, as Koh Samui's most exclusive boutique hideaway. In addition to offering the same idyllic style and charm as its famous namesake and sister hotel Poppies Bali, Poppies Samui offers its guests exceptionally high standards of friendly service and attention to detail in a perfect location. Just 24 luxuriously appointed individual Thai style cottages hide amid the tropical greenery, each offering privacy from the others, and each combining the best of Thai style with modern western comforts. Screened windows and inner doors, leading onto a private terrace, let in the sea breezes, while both air-conditioning and ceiling fan come as standard. The unique bathroom, with its own private screened garden open to the sky, features a sunken bathtub and shower set in cool marble surrounds. 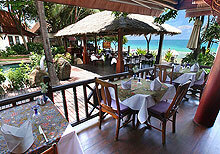 Poppies Restaurant is firmly established as one of the leading restaurants on the island, where you can dine under the stars overlooking the beach in an open sided thatched 'sala', or in the magnificent Ayuthaya style solid teak pavilion beside the pool. The path to each cottage leads through lush landscaped gardens passing meandering streams, fish ponds, teak bridges and waterfalls. Between these gardens and the sea lies a spectacular crystal-clear free form swimming pool with natural rock surrounds, complemented by a sparkling rock pool jacuzzi. Poppies is owned, managed and staffed by a dedicated and established team, many of whom have been employed since its opening. The resort's staff to room ratio is over 3 to 1. As a result Poppies is quite simply a haven of comfort, excellent food, and personal service, particularly for couples (although children are welcome) at affordable prices, where as many as 35% of our guests are returnees. 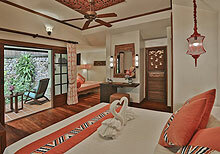 Take the the hotel tour to see images, and 360 panoramas of our rooms, restaurant and gardens. We are happy to have received a Certificate of Excellence for 2014, 2015, 2016 and 2017, and the traveller's choice award five years in a row. 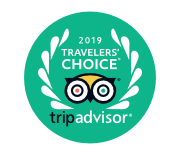 In 2018, Poppies was named the #1 Small Hotel in all of Thailand, and rated 5th in the category of Service for all of Thailand.